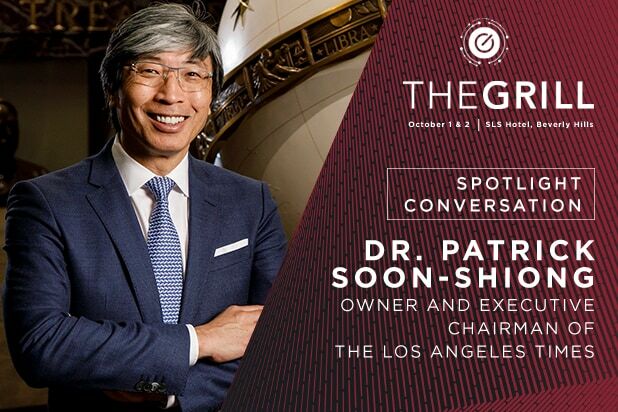 TheGrill is delighted to welcome Dr. Patrick Soon-Shiong, owner and executive chairman of The Los Angeles Times, as the Spotlight Interview at TheGrill 2018 on October 1-2. Soon-Shiong joins Wrap editor-in-chief Sharon Waxman for a one-on-one interview on Day Two of the conference, where he’ll talk about his career, his views of the media landscape, his extraordinary journey in life, and most notably the future of The Los Angeles Times, which has been buffeted by decades of ownership changes and challenges posed by the rise of digital media. Born and raised during apartheid in South Africa, Dr. Soon-Shiong is a remarkable entrepreneur, scientist and civic leader who this year bought The Los Angeles Times with the aim of revitalizing the legacy news organization. Soon-Shiong joins a powerful lineup including producer Will Packer, AMC Networks President and CEO Josh Sapan, Showtime CEO David Nevins, Group Nine Media Founding CEO Ben Lerer, Dolby Laboratories Chief Scientist Poppy Crum, Helios and Matheson Analytics CEO Ted Farnsworth, REDEF CEO and Chief Curator Jason Hirschhorn, and many others! 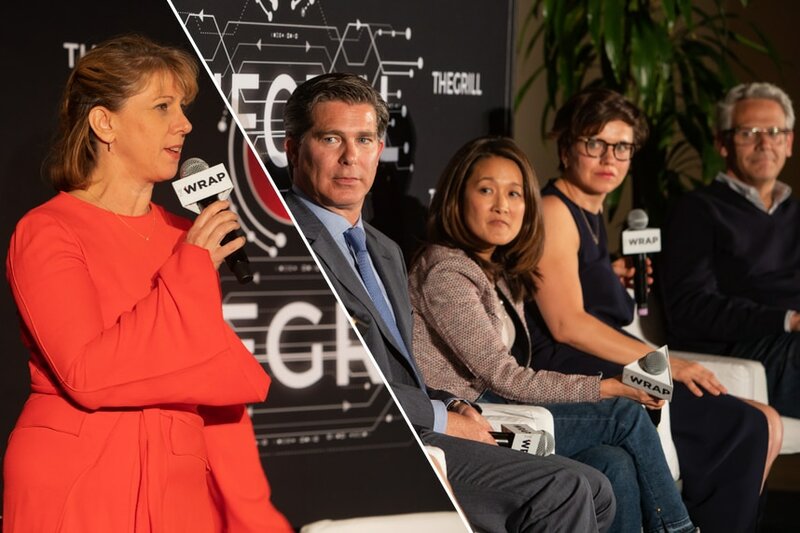 Join us at TheGrill, TheWrap’s annual business conference, which leads the conversation on the convergence of entertainment, media and technology, bringing newsmakers together to debate the challenges and opportunities facing content in the digital age. Ahead of TheGrill 2018, which kicks off Oct. 1-2, TheWrap hosted TheGrill: Special Event at Shutters on the Beach in Santa Monica Thursday night. TheWrap's founder and Editor-in-Chief Sharon Waxman moderated the discussion, "The Future of Content: Distribution in the Digital Era." Take a look below at the scene as hosted by TheWrap along with Gerber Kawasaki. Guests gather for cocktails and appetizers ahead of the panel discussion at Shutters in Santa Monica. A guest speaks with panelist Charlotte Koh, head of digital media & programming at Hello Sunshine. Keaton O'Hara of BenRiach poses for a photo. Sharon Waxman and Ross Gerber, co-founder, president and CEO of Gerber Kawasaki Wealth and Investment Management, pose for a selfie. The Gerber Kawasaki team poses for a photo ahead of the panel discussion. Ross Gerber poses with a guest. Teammates from Gerber Kawasaki pose for a photo ahead of TheGrill's panel discussion. Keaton O'Hara serves BenRiach whiskey to guests during a cocktail reception. Sharon Waxman introduces panelists at TheGrill's Special Event. From left to right, Sharon Waxman, Ross Gerber, Charlotte Koh, Kathleen Grace and Sam Register speak at TheGrill Special Event panel "The Future of Content: Distribution in the Digital Era." Kathleen Grace, CEO of New Form, discusses short-form content and reaching consumers on mobile. The panelists discuss the ecosystem for content creators in a digital age. Standing room only for the panel discussion at Shutters Hotel. The panelists discuss topics ranging from the influence of Facebook, Netflix, Disney and Instagram Stories on content creators. Sharon Waxman poses a question to the panelists about distribution in the digital era. Sam Register, president of Warner Bros. Animation & Digital Series, discusses reviving "Animaniacs" with Steven Spielberg. An attendee identifying herself as a content creator asks a question to the panel. The panel responds to an audience question at TheGrill Special Event. Cindy Lin (left) of Infotainment China gathers with friends at TheGrill. Cocktails and dessert follow the panel discussion at TheGrill. From left to right, panelists Sharon Waxman, Kathleen Grace, Charlotte Koh, Ross Gerber and Sam Register pose for a photo. Sharon Waxman speaks with an attendee at TheGrill in a cocktail reception following the panel discussion. Ross Gerber and Sharon Waxman speak with an attendee at TheGrill's cocktail reception. Guests enjoy cocktails and conversation at TheGrill at Shutters on the Beach Hotel in Santa Monica.